THE new R&S SMJ100A vector signal generator from Rohde & Schwarz is suitable for use in development as well as production. Its high signal quality, its short frequency and level setting times and its easy operation ensure fast, reliable measurements. The R&S SMJ100A meets all challenges that diverse applications place on a modern vector signal generator. On one hand, the instrument provides the high signal quality and flexibility required in development. On the other hand, the R&S SMJ100A is suitable for use in production, due to its short setting times and flexible baseband that provides a wide range of realtime signals or replays precalculated waveforms. As the third member of the R&S SMx family, it complements the application spectrum of the vector signal generator R&S SMU200A, whose two-path capability makes it especially suitable for use in development, and the R&S SMATE200A production/automatic test equipment (ATE) version. With the 100kHz to 3GHz (or 100kHz to 6GHz) frequency option, the R&S SMJ100A covers all frequency bands that are important in digital RF transmission. The internal optional baseband generator can handle a large number of digital standards. For example, it supports GSM/EDGE, 3 GPP FDD including HSDPA, CDMA2000, WLAN IEEE 802.11a/b/g as well as WiMAX. Furthermore, simulation software R&S WinIQSIM and Matlab are supported by the internal arbitrary waveform generator, which offers sequences up to 64M/S in length, expanding the standard range by 3GPP TDD and OFDM, for example. 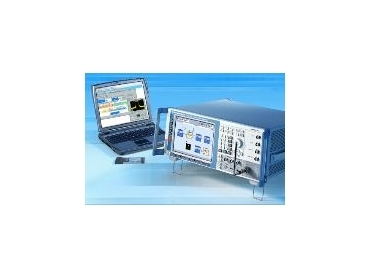 If the internal baseband generator is used, the R&S SMJ100A provides signals with a bandwidth up to 80MHz – sufficient for the next generation of broadband transmission methods. In addition, analogue I/Q signals can be fed in. For these signals, a modulation bandwidth of up to 200MHz is available. The low SSB phase noise of -129dBc (at 20kHz carrier offset and 1GHz carrier frequency) documents the high signal quality of the R&S SMJ100A. With 3GPP FDD (test model 1/64), the adjacent channel leakage ratio (ACLR) is typically 69dB. Speed is a crucial factor, primarily in production. The R&S SMJ100A provides short settling times of less than 5ms, which are reduced even to 450µs in a special list mode. The wear-free electronic attenuator allows a quick level change over the entire frequency range. The R&S SMJ100A, like its sister model the R&S SMU200A, is equipped with an easy-to-operate GUI. The large colour display (800 x 600 pixels) shows the signal flow inside the instrument by means of a block diagram. Each functional unit, such as RF or baseband, is assigned a separate block. Active components are highlighted in colour. Menu-guided operation of the R&S SMJ100A also utilises the display's graphical possibilities. It is based on a window structure used by modern PC operating systems, allowing a number of windows to be active simultaneously. A WinBar enables the user to switch quickly from one window to another. The context-sensitive online help provides additional support. Besides the RF output, the R&S SMJ100A also features differential I/Q outputs – which are used, for example, for tests if the DUT is not yet equipped with an RF frontend or if only the baseband module's performance is to be tested. Additional interfaces increase the vector signal generator's versatility. The R&S SMJ100A receives remote-control and remote-operation commands via the IEEE 488.2 bus or the LAN interface (100BaseT). The signal generator can receive the timing of the test module via trigger inputs. Besides the VGA interface for an external monitor, the signal generator has USB connectors on its front panel for connecting a mouse and keyboard. The interfaces can also be used for a USB stick, for example. This is a practical and easy way to provide waveforms for the arbitrary waveform generator. The R&S SMJ100A rounds out the range of R&S SMx products from Rohde & Schwarz.